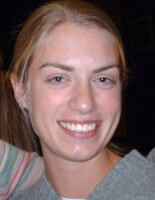 There's a moment of ultimate reward for a teacher: that moment when the light bulb goes off in the heads of your kids. I don't mean just those small, everyday light bulbs – I'm talking the major, industrial-strength, 150-watt light bulb, the kind that illuminates the deep dark recesses of your students' minds. For most of this year's indoor drum line season, I didn't think my current crop of pit kids were ever going to have that light bulb moment. Don't get me wrong, they worked hard and played pretty well, but they never seemed to quite have that passion that results in a constant striving for perfection, and some days it was like pulling teeth to get them to perform up to their abilities. And then one night a couple of weeks ago, we were rehearsing outside on the concrete basketball courts. It was the end of rehearsal; it was getting dark, the kids were antsy because it was the Thursday before their Good Friday/spring break holiday, and they were eager to leave and get the break started. "We should do back-to-back run-throughs," I said to the drum line director. "We can see how well they perform when they're really tired." I expected some moaning from the kids about this one, and there was a little, but to my surprise, the pit all cheered. Instead of their typical acceptance, indifference, or worst of all, whining, they actually adopted a bring-it-on attitude. Then they played the second run-through better than the first! The light bulb had gone off. Against all my expectations, they finally got it. Two weekends ago we took the drum line to WGI World Championships in Dayton, OH. Our kids played really well. In their first year in Open class, and only the second year for the program to compete in WGI, they made it to semifinals and placed 15th overall. I was extremely proud of the students and how well they coped with the corrections and improvements we made, and of how they pushed to get better till the very last minute of the season. The last show was the best run of the year, and probably the best they could have played. While our best didn't quite measure up to some other groups' best that Friday, the performers gave it all they had, and you really can't ask for anything more than that as an instructor. 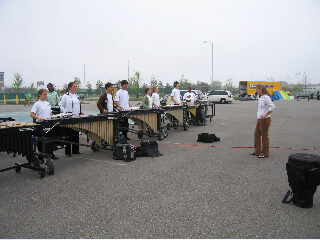 Tannert rehearses her group before the 2006 WGI World Championships. There are two big things I try to teach my students: that it's worth working hard to achieve a goal; and that the payoff for all the work is when you know the material so well, you don't have to wonder whether you'll perform well. Playing becomes joyful at that point. Those are the standards we measure our season by, not some number assigned to our exhibition of skills at a given hour on a given day. I had years of drum corps instructors tell me that you don't let a bunch of guys in green shirts (judges) decide for you how feel about your season, and truthfully, I don't remember what the score was either when the group I was in finished last in Division I in DCI in 2002, or when we won the WGI World Championship in 2004. I remember the feeling of getting a standing ovation at four in the afternoon in Madison (at DCI) and the electricity when we walked on the floor that night in San Diego (at WGI). Sure, my kids were more than a little disappointed not to make finals this weekend – we all were, because we worked hard all season long. But in the end, the hard work is the reward, and in 10 years, the students will no longer remember what the number on the page was. They'll just know how they felt when they walked off that floor on Friday morning. And they'll know that everything they achieved this season, they earned, and that furthermore, if they did it once, they can do it again. That's a lesson far more valuable than a medal of any color.